This notable Irish surname, now widespread in Counties Donegal, Derry and Cork, is an Anglicized form of the Old Gaelic "O'hEigceartaigh", descendant of Eigceartach, a personal byname from "eigceartach", unjust. The principal sept of O'hEigceartaigh was of the Cineal Eoghan, that is, belonging to that group of people descended from Eoghan, son of Niall of the Nine Hostages, 4th Century High King of Ireland. This sept was ocated on the borders of the present counties of Donegal and Derry, and in the 14th Century, the barony of Loughinsholin (County Derry) was their chief habitat. By the 14th Century the name was more numerous in Tirkeeran (County Derry) and Inishowen (County Donegal), and also in the baronies of Barrymore and Carbery West in the Munster county of Cork, where a branch of the Ulster Hegartys settled. 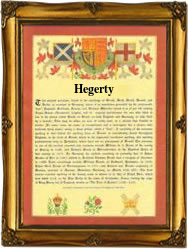 In the process of Anglicization "O'hEigceartaigh" acquired many variant forms including: O'He(a)gertie, O'Hagirtie, (O)Hagerty, Haggarty, Haggerty and Hegerty. William Hegerty, a labourer, aged 25 yrs., who embarked from Liverpool on the ship "Cambridge" bound for New York on May 8th 1846, was an Irish famine emigrant to that city. A Coat of Arms granted to the Hegerty family is a silver shield with an oak tree eradicated proper, on a red chief three birds argent, beaked and legged sable, the Crest being an arm in armour embowed, the hand grasping a scymitar all proper. The first recorded spelling of the family name is shown to be that of Maolmuire O'Hegarty, a member of O'Neill's army, which was dated 1602, in "Records of the Battle of Kinsale", during the reign of Queen Elizabeth 1 of England, known as "Good Queen Bess", 1558 - 1603. Surnames became necessary when governments introduced personal taxation. In England this was known as Poll Tax. Throughout the centuries, surnames in every country have continued to "develop" often leading to astonishing variants of the original spelling.